Rhodium Plated Out of This World Fashion Jewelry Set. 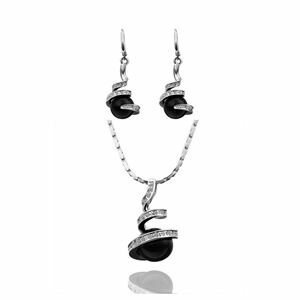 Features Black Stones With Swirls of Crystals. Necklace is Adjustable From 17" to 19" Long. Earrings Drop 2" for a Little Flair!. Packaged in Our Signature Black Satin Pouch.